Chaz Deans: Tanaka, it's that time of year again where the major fashion cities are showcasing their upcoming season collections and first up on the chopping block is, London. I will admit I always get excited for Fashion Week (month) but I feel a little let down by London. The highlight for me was Burberry Prorsum, and Alexander McQueen. Mostly because they appealed to my personal aesthetic and not in the ‘usual’ London way of an obsessive repetitive presentation of outerwear and suiting options, though still very present. Which in essence is what London Fashion is… Though I’ll say this, individual Moschino pieces added to any of the more tailored presentations would call for a major style moment. Moschino styling was difficult to digest, but the merit in each individual piece was evident. All in all, LFW and LC:M wasn’t much to talk about, in my estimation. Side note: street style during this time was more attention-grabbing than the actual collections. Tanaka: Agreed, London at first glance was a bit of an atrocity. Coco Rocha tweeted "LCM be like" with images from Zoolander and after I gathered myself from laughing way too hard, I thought, that pretty much sums up Moschino's and Sibling's madness of a collection. Beyond that though there were some decent ones that I wouldn’t cringe if I saw a man on the road in. The thing with mens fashion is you really dont have much to work with so for me, I love when a designer puts his own twist on a classic piece and breathe new life into it. I do think some of McQueen’s pieces achieved that but for suits I think Sir Tom Baker and Gieves & Hawks had really clean modern looks that I can count on seeing on the red carpet this year. Christopher Kane had to be one of my favorites though! His clean and fun use of prints really impressed me along with Ada + Nik’s mastering of the marriage between urban and high fashion. Chaz: Now we are in Milan for the next leg of fashion showcases. I’m already obsessed with a few of the collections and really am screaming for them to be new additions to my wardrobe. Marni, Vivienne Westwood, Missoni, not to mention the immense amounts of detail employed by Versace, Ermenegildo Zegna and Giorgio Armani were my favorites so far… I must say Vivienne’s collection gave me chills, for it felt like true fashion and not a hyper-stylised mosh of regurgitated tailored fabric projected as ‘fashion’: a stylist presentation. Comparing, for instance, to London, which is essentially a spectacle of 'stylists' showcasing their 'arrangements', seeing the VW collection was a breath of fresh air. It was authentic design for the more eclectic character but has an easily ready-to-wear component to it, if you take the individual components (like Moschino). It was a controlled kind of crazy; medicated, perhaps. It’s what I would imagine at a gentleman’s tea party in the alternate universe of Alice in Wonderland - once beyond the rabbits hole, of course. Then again, it is Mrs. Westwood we are speaking about, who is a mystical creature in her own right, and her collection worked. It’s somewhat less bizarre cousin, Missoni, also had a certain subdued unconventional-istic element to it which would appeal, again, to the more adventurous but still could be explored by the more conservative. Like Burberry, Marni played with fur-esque looks which popped against the overlying dark theme of their collection. I'm not a fan of much color, but for some reason I found myself digging this... Perhaps fur and color is in my near (distant) future. Tanaka: Hahahaha - yea, Vivienne, the mystical creature LOL - she sure is. I think when it comes to aesthetics more than anything else I would define my style as mostly minimalist and for that reason Westwood’s collection wasn’t my cup of tea. 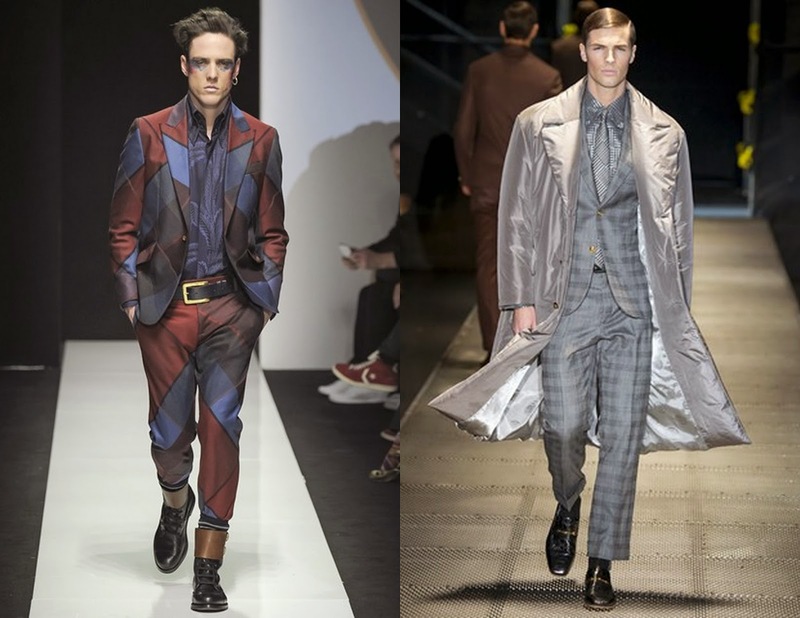 I think both Emporio Armani and Giorgio Armani were phenomenal collections and along with Calvin Klein, they might just rule the men’s red carpet this award season. Versace and Fendi had a superb colour palette complemented by genius patterns and patch work which translated into great collections also. 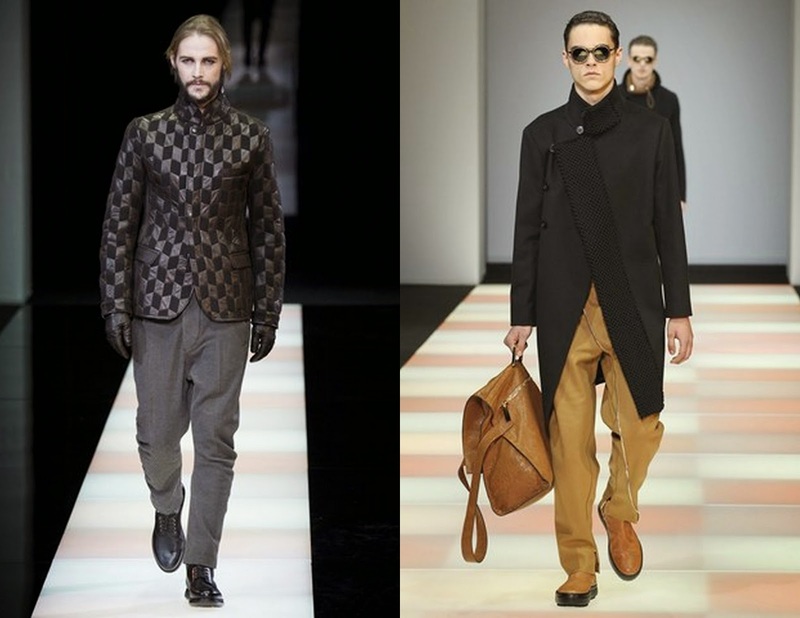 Canali is definitely worth mentioning too for their impressive use of patterns that was unlike any other collection. I think most of all I enjoyed the different themes that were manipulated to create fresh looks; from wall street to militia, “The Man on a Mission” seemed to be motif in these designers’ thought process. I also loved seeing suede, velvet and baroque being incorporated in the different collections and retaining their masculine essence. While I may not love some collections in its entirety, there were several that I could single out that had brilliant statement pieces. 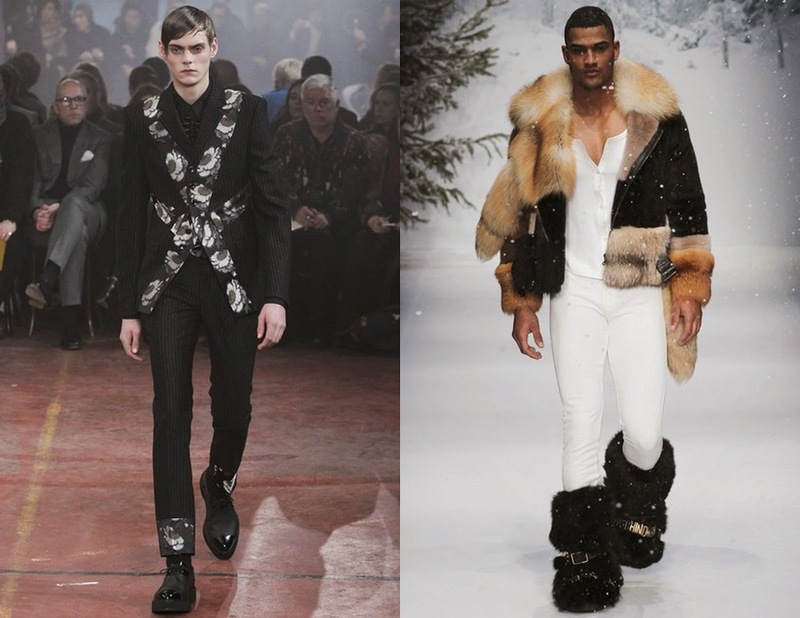 In all I think Milan showcased more appealing ready to wear menswear that certainly made me smile more so than cringe. 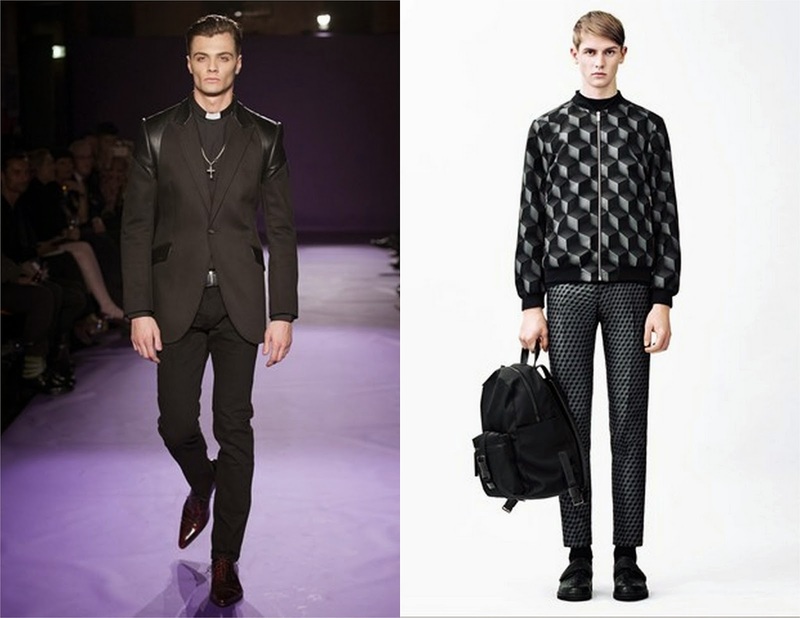 Chaz: Comparatively, Milan collections were a bit more appeasing to the eyes. Even in more rigidly sartorial collections of the london collective like Hardy Amies - I suppose once showing in Italy you’d expect a certain flair when it comes to suiting, like with Canali. Don't get me wrong, British fine tailoring is impeccable. Whatever it is, the ‘Italian’ collections so far are much more palatable than its ‘British’ counterparts. I particularly enjoyed what seemed like a theme for the driven man who seeks to stand out, but not for reasons of needing attention. In today’s day and age where everyone is always on the go, I did also appreciate much of the designers attempts to play with the paradox of fusing casual and formal elements. Also attempting to use color palettes that are easy to come together without much thought or effort, say perchance you were to purchase an entire collection. Plus there was an element of rugged and grunge tied in with a level of conservatism and high-snobiety that kind of played along with the high-low trend happening. On the note of trends: zippers, elaborate prints and patterns, furs, suede, velvet and silky metallic fabrics seemed to have gotten much play. Tanaka: Certainly picked up on those trends as well! I am eager to see what lies ahead for the rest of the season! Have you been keeping tabs of A/W 2016 Fashion week? Share with us some of your favorites!